Cross posted from the StartupGiraffe blog. 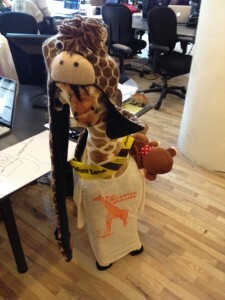 A year ago Startup Giraffe was born. Looking back it’s amazing how far we’ve come. Like most business, our first few months was about getting our head above water, earning enough to pay rent, tweaking our business model and learning the legal, accounting and general ins and outs of starting a new company. We made a lot of mistakes but were lucky enough to experience some successes too. Today, we have lots of good problems related to growing our business sustainably. The more startups we launch, the stronger our ability to execute and support our companies becomes. We’ve grown our team from two to four full time giraffes plus a partnership with an awesome design agency. We’ve launched 11 companies and empowered 25 entrepreneurs to take the leap from idea to starting their own company. We’ve proved that partnering with the giraffes to jumpstart your initial development can lead to traction, revenue, significant business development partnerships, outside financing, and full-time job creation (including recruiting in-house technical teams). Our portfolio companies have been featured in the NYTimes, Mashable, Forbes, Huffington Post, Fashionista, Business Insider, WWD and other major publications. By being smarter about how we build product we’re able to do more with less. We’re now able to launch a thin slice of any idea in 6 weeks while maintaining lives and relationships outside of the office and working at a sustainable pace. We’ve bought hundreds of dollars worth of giraffe gear including a giant stuffed giraffe, hats, dope t-shirts and cute mittens.